My friend Amy introduced me to quinoa (pronounced ‘keen-wah’) a couple of years ago as I was desperately searching for some allergy friendly variety for our diets … and I am SO glad she did!! It is an amazing seed – a real super-food; high in amino acids and full of protein, iron and calcium and a great source of low GI gluten-free fibre. For all of these reasons it has become a regular feature on our menu. Quinoa has a lovely nutty taste – almost like a mix between the chewiness of barley and the fluffiness of cous cous. It can have a bitter taste, but that is easily fixed by soaking and rinsing before you cook it. Salmon and roast vegetable quinoa. Place the quinoa in a large saucepan and cover with about 2L of water. Allow to soak for at least an hour (mine often sits for a few hours before I get back to it! ), then drain and rinse well. 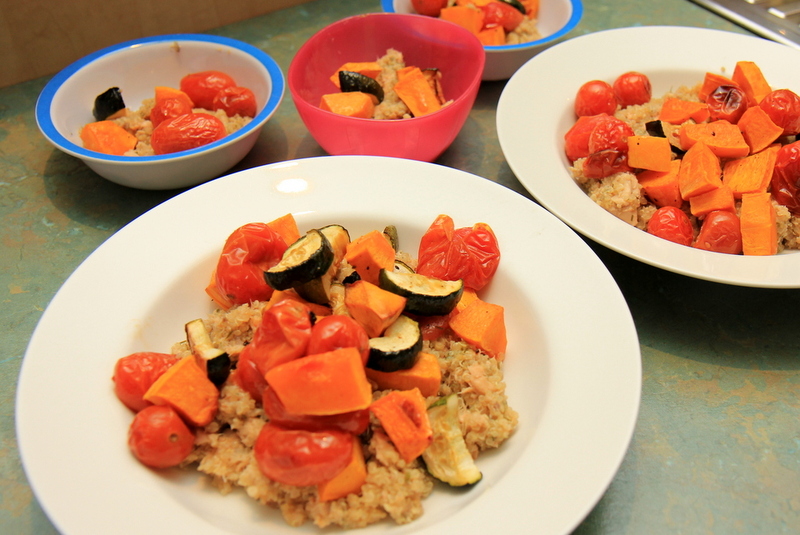 While the quinoa is soaking, cut up the vegetables (leave the tomatoes whole) and place in a large baking dish. 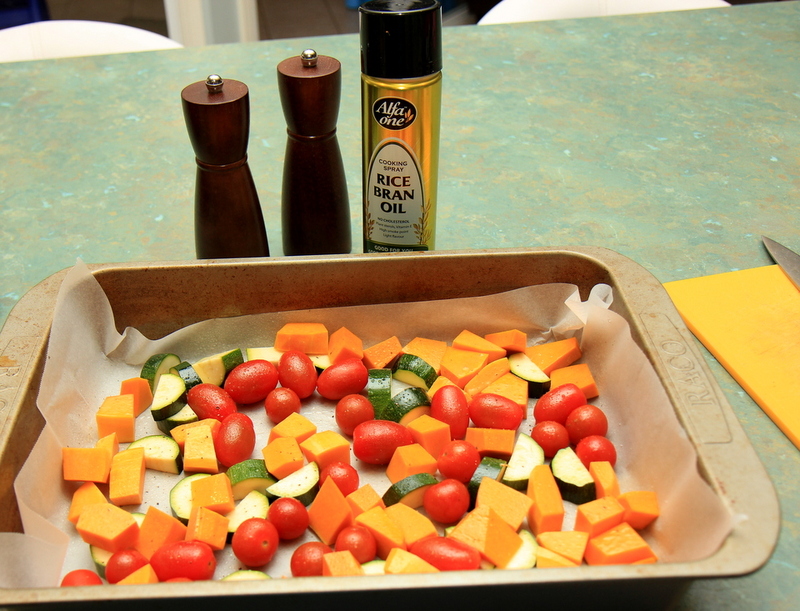 Spray with oil and season with salt and pepper. Roast in a pre-heated 180 C oven for about an hour, or until they are just cooked (you don’t want them to get too squishy). Return the drained quinoa to the saucepan and cover in 4 cups chicken stock. Bring to a boil and then reduce to a simmer for about 15 mins. Drain the excess stock. Add the salmon, dill and olive oil to the saucepan and gently mix through on a low heat. Serve the quinoa into bowls and top with the roast veggies. This one doesn’t freeze so well as a complete meal (although I have done it! ), but I often make a double serve of the plain quinoa and then, leaving a little excess stock in it, I freeze it. Thaws well and there’s half a meal ready. Have you tried making porridge with quinoa Jess? Very yummy for summer! We had quinoa this week because I found it at Coles (sorry Jess!) in a sachet mixed with some Morrocan flavours ready to put on the stove top with water. It was yummy too – I found it in the health food section by a company called Celebrate Health. I was expecting the bitterness but it wasn’t there. The quinoa was dry in the packet so don’t know how they did it!